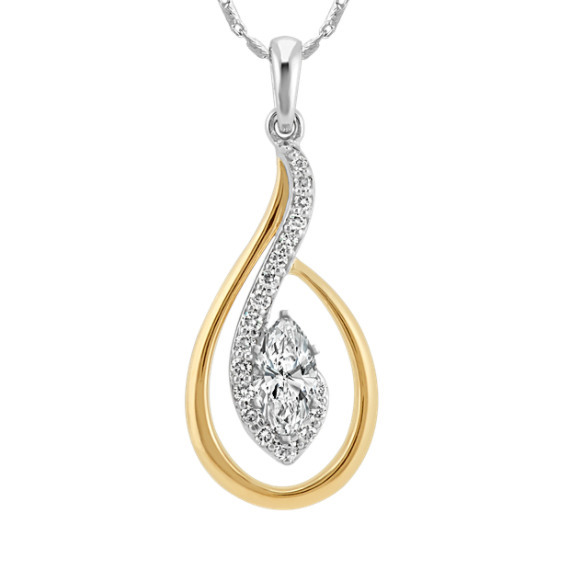 Round Diamond Pendant for Marquise Gemstone (22 in) | Shane Co.
Crafted in quality 14 karat white and yellow gold, this teardrop pendant has a 22-inch adjustable chain with a 2 inch extender and is part of our exclusive collection, Expressions by Tom Shane. Highlighted by 8 brilliant round diamonds at approximately .11 carat total weight, simply place a marquise gemstone of your choice at approximately 6x3mm and create a unique look that you will wear from day to night. For assistance in finding a gemstone color currently unlisted, Live Chat or call an online customer service representative at 1-877-467-4263.